If you can explain it, I will build it. I've dreamed of having one of these in the track that is currently underconstruction. If anyone can translate Electronics into English I am listening, and eager to see it in action on my track. Don't know what sort of explanation you guys are after but I will give it a go. 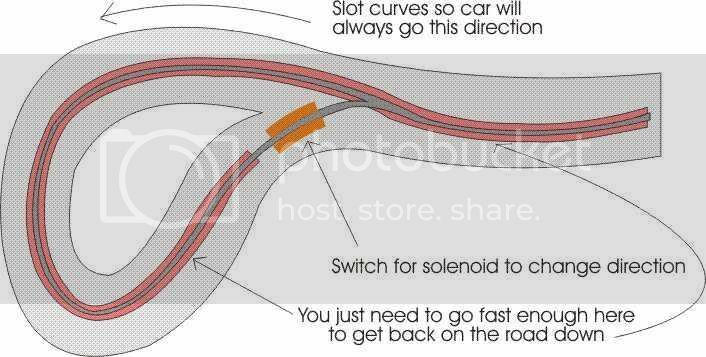 The contacts on the relay or solenoid as it is called in the diagram is connected to the wires that give power to the track, with the relay off the car travels towards the loop. As the car goes over the dead spot the relay is switched on and locks on through another contact, the power to the track is reversed allowing the car to travel away from the loop. The toggle switch (a push button momentary off switch would probably be better) is used to cut the locking circuit to the relay turning it off so the power is back to normal. I don't think it could be made as a stand alone item as it basically already is, you just need a relay, a switch and the track to connect it to, but I could be wrong. Edited by Count, 03 February 2008 - 12:25 AM. Ask not what MDF can do to you, rather ask what you can do to MDF! As the car goes over the dead spot the relay is switched on and locks on through another contact, the power to the track is reversed allowing the car to travel away from the loop. I had a go at wiring all of this up. And wired it up using the above diagram. It all seems to work...the car goes towards the loop, around and hits the dead spot, I can hear the relay click and see the connection switch but then when the car leaves the dead spot the relay switches back immediately and doesnt stay on. The reverse part definately works as I can leave a car on the dead spot and another car will run back the other way but obviously that is no good. 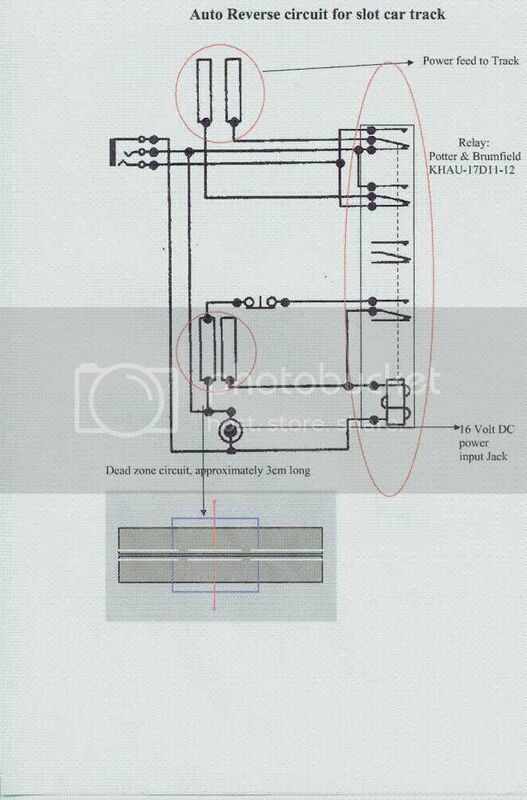 The only thing I can think of is the switch part which runs between the dead spot and the coil. I have figured it to be a simple SPST momentary switch....perhaps it is something different. So the question is have I bought the wrong relay or is there something else I need to do to get the relay to lock on when activated? Edited by Johno, 28 February 2008 - 07:36 PM. Hmm reading about relays on Wikipedia I may need a Latching relay that when the current is switched off, the relay remains in its last state. Sounds like you might have forgot part of the circuit, have you wired the relay up to a set of contacts on the relay so when the relay operates it will hold itself on like the forth set of contacts on the circuit diagram above. I think I have it sorted. I have got the wrong type of switch for the reset mechanism. I must have bought a momentary on switch not an off. With the switch wired in the relay is turning off straight away but I removed the switch from the circuit and the relay turned on and stayed on until I untwisted the two wires breaking that circuit. Edited by Johno, 01 March 2008 - 04:50 AM. Well I picked up a normally closed switch and soldered it into my test loop and it all works. Ive taken a cpl of photos but I doubt they will be of any use. 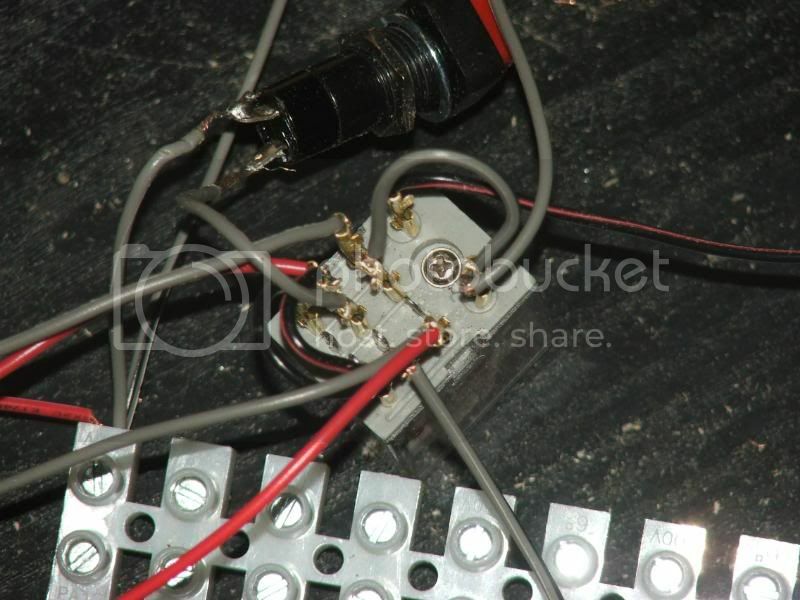 As you can see my wiring and solder work leaves ALOT to be desired. Have you got a part number for the correct switch? But any SPST switch momentary switch that is NC (normally closed) is fine. Capable of getting even the simplest tasks horribly wrong. So how does it know when the car has rejoined the single lane rather than the loop? Also how is the polarity switched for the rails? I'd presume there is one of these at both ends, and as the car switches one open it closes the other in preaparation for the return leg? Thats what the switch is for matt. Sadly I have hit a new hiccup in my hill climb. 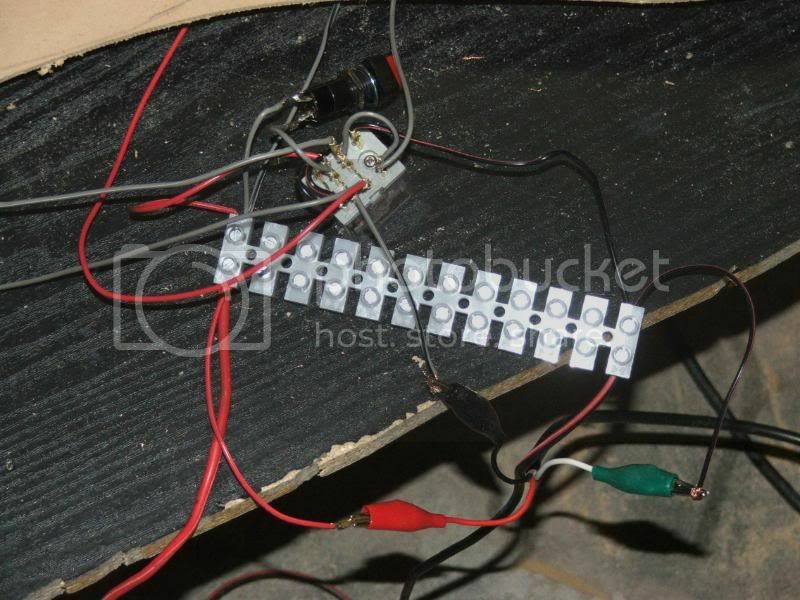 I wired the track up this evening and on testing the car drives up the hill goes around the loop, over the dead spot but then it fails to trigger the relay. So then I get the car and push it along the track and over the dead spot and click the relay activates. I push it along again and click the relay works. So I know the dead spot works and triggers the relay, just not while im running a lap. No idea if it is a speed thing or something else but it is a bit annoying.